The Democrat is declared the winner of Minnesota's Senate election, but Republican Norm Coleman has only begun to fight. 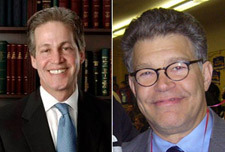 Norm Coleman, left, and Al Franken. Minnesota's Canvassing Board has certified the results of the recount conducted in the state's U.S. Senate election, and Democrat Al Franken has been declared the winner. He currently leads Republican Norm Coleman, the incumbent, by 225 votes. This isn't the end of the battle over the seat, which has now stretched two months past Election Day. After the Minnesota Supreme Court on Monday rejected the Coleman camp's request to have additional rejected absentee ballots tallied, a fuller lawsuit became inevitable. It must be filed within seven days, but could take weeks to resolve. In the meantime, no election certificate can be issued, which throws a wrench into the works and means that no one's really sure who will be occupying the seat in the meantime, if anyone. Coleman's term ended on Saturday, and on Monday Senate rules committee officials ordered the doors to his offices locked. New senators are supposed to be sworn in on Tuesday, and there are some indications that Democrats will try to seat Franken. However, top Republican Sen. John Cornyn, citing the lack of a valid election certificate, has said his caucus will fight any such attempt.